Sew Fantastic: Something new ! :: Swap Anyone? Something new ! :: Swap Anyone? New shop item. Totally unexpected, but very much loved by me and my little Sophia. Today Sophie were playing dress up (my favorite game too) After a brief little pow wow (yes we talk to each other, me more then her you know) We decided to make a mini purse. I dug out my purse supplies box from when I used to make bags and Key fob's, and we both started looking through it. Then we went through my Japanese scrap bin and found the coolest fabrics ever for our purses. No paper, no drawing, not really much math was involved either. But look what came out of that!. Our first one (Sophie's purple deer purse) was CUTE, very time consuming but worth it. I will get some pictures of Sophie with her new purse tomorrow (she loves the little purple deer). Remember when we were all talking about a coin swap? Like September ... Ha! (we can change the measurements late if need be) All sent to the host (me) jumble them up, and send them back out all mixed up. Then the other idea was to have a flicker group with the quilt or other project we made with them. Post here if your interested. If enough people still are we will definitely do it. I'd be interested in a coin swap. 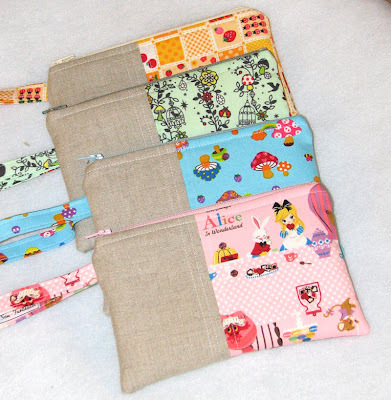 Cute little purses! an idea for you-- a hair curling iron holder w/ the batting used for potholders. Great for on the go--travel. If its made with the batting like a pot holder no waiting for iron to cool down. what do you think? Love the purses!!! Mushroom fabric is my favorite!!! The purses are adorable! I would love to join the coin swap. Darling purses Terri! What's the tan colored fabric you use for a lot of your stuff? Looks a bit like linen? Count me in for the swap! I would love to be in the swap~! Sign me up for the swap!! Sure, I'd love to swap. I love the idea of a coin swap! Count me in! I'd be interested in the coin swap. I would love to be included in the swap, as long as the instructions are clear, so I know what types of fabrics to send....I am a relative new quilter, so this would be so fun!! I probably shouldn't but I can't resist. I would totally do it! I'd love to join a "coin" swap. Let me know the details. I would be interested in a "coin" swap!